The key to a successful change in your diet or “foodstyle”, as I prefer to call it, is that you have to end up with something that is sustainable, day in and day out. Well, I just celebrated my 1 year anniversary of this Paleo/Primal lifestyle and I’m still going strong. It is indeed a lifestyle and has simply become the way I eat now. Lean proteins such as grass-fed meat (ideally), free range fowl, and wild-caught fish (steak, cuts of beef, lean hamburger, chicken, turkey, salmon, tuna, etc. for those of us on a tighter budget). Seasonal fruits and vegetables (eat all the veggies you want), but no white potatoes or legumes. It is ok to eat sweet potatoes in moderation (I love them). NO grains, sugars, or dairy products. None. Nada. Zilch. It may initially sound restrictive, but you actually end up eating a lot! It’s just that you are eating really healthy foods instead of wasting your time (and calories) with junk carbs, sugars, and bad fats. I’m still amazed by how much I eat now and can’t gain a pound, because I’m working out hard with CrossFit and eating healthier foods. Traditional diets where you restrict your intake seem even more ridiculous once you discover this way of living. I never count calories or worry about how much food I’m eating. Never. I understand that you might be skeptical and you should be. There are so many fad diets and false promises out there. But, I highly recommend that you at least read more about it and then decide. 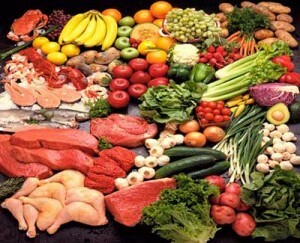 Robb Wolf has a great FAQ on what the Paleo diet is all about. His Quick Start Guide is very helpful (PDF format). Mark Sisson has a great site that talks about the Primal way of eating, which is similar to Paleo, but a little more relaxed. He talks about the differences between Paleo and Primal here.